Pat Metheny: acoustic and electric guitars, guitar synthesizers; Lyle Mays: piano, keyboards; Steve Rodby: acoustic and electric basses; Paul Wertico: drums; Armando Marcal: percussion, voice; David Blamires: voice, Mark Ledford: voice. Recorded March/April 1987 at Power Station, New York, New York. Engineer: Rob Eaton, assistant engineer: Alexander Haas. Produced by Pat Metheny, Co-Producer: Lyle Mays, Associate Producers: Steve Rodby & Paul Wertico, with Steven Cantor and David Oakes. Originally Mastered by Bob Ludwig at Masterdisk, Remastered by Ted Jensen at Sterling Sound, New York, New York. Originally released on Geffen Records, and reissued in 2006 on Nonesuch/Metheny Group Productions. Thirty years ago in 1987, the Pat Metheny Group released the defining “Still Life (Talking)”. The album was significant in several ways, as much as it was an expansion on the Brazilian sound of “First Circle”, it was also a departure. The guitarist’s ending of a nine year relationship with ECM signaled a resounding shift that reverberates to this day. Metheny was the first jazz artist to be signed to Geffen records in 1985, releasing the brilliant if controversial “Song X” with free jazz icon, the late Ornette Coleman that perhaps did even more to solidify his reputation amongst jazz purists than “80/81” (ECM, 1980) as a force to be reckoned with. “Song X” revealed in no uncertain terms that he had reached an unprecedented level of creative and artistic control that at the time for any jazz artist was extremely rare: his Metheny Group Productions imprint allowed for complete freedom to make the product, Geffen only distributed the final album. “Still Life (Talking)” sonically is a masterpiece, the use of the recording studio as an instrument is increased tenfold with engineer Rob Eaton at the helm who was an assistant engineer for “First Circle” beginning to define the sonic signature of the Metheny Group which he would refine and perfect over the next eighteen years. Specifically Steve Rodby’s bass sound is much richer and present than it’s predecessor adding an extremely sharp focus to the rhythm section of PMG co pilot, the great pianist Lyle Mays, then drummer Paul Wertico, and percussionist Armando Marcal, making his band debut. The large palette of sounds courtesy of Mays unmistakeable synth orchestrations from his Oberheim, and Prophet V were enriched by the recent addition of the Roland JX 10, a synth that would become the main source of his signature (as Mays called it in a Jazziz interview podcast) flutophone sound and Metheny’s much more in depth use of the Synclavier. Though first heard on “Offramp” (ECM, 1982) by 1987 he had head first dove into it’s composing, sequencing and sampling capabilities, increasingly evident on the new album. Metheny created basic sketches of the tunes through the Synclavier which would be enhanced by the live musicians. Adding even more to the dense textures were the recruitment of Canadian vocalist and guitarist David Blamires and Detroit vocalist/trumpeter the late Mark Ledford (1960-2004) to replace Pedro Aznar who had temporarily left the band and the two men opened the music up even more with their decidedly more poppish and soul inflected approach to wordless vocals. Additionally they could play just about any instrument under the sun, particularly dazzling in concert. I first heard the album in either my sophomore or junior year of high school, as the guitar and orchestra teacher, and also my mentor Lawrence Lolli was transcribing the ethereal, memorable intro to “Minuano”. At the time, I was still inextricably wedded to straight ahead jazz, hard bop to be exact, and in my snobbery foolishly considered Metheny “smooth jazz”, something that couldn’t be farther from the truth. Even at that stage, Lolli who is a diehard Metheny fan and was trying to open me to Pat’s universe, there was something magical about that lilting intro. Less than a year later I became a raging Metheny fan, and this album as well as every album he’s ever made has not left constant rotation in my daily listening. A sort of gently cycling repeating guitar figure gorgeously dressed by Marcal’s shaker percussion and distant melancholic vocals from Blamires and Ledford is initially stated, then again in a gorgeous unison falsetto. Ledford’s voice really pops out on this second repeat of the vocal line, as if they are just examining the beauty of the universe at a leisurely pace. The intro is iconic, and was sadly excised from the piece around the time of the tour associated with “Secret Story”, and the tune is played to the present day without the haunting intro. The liquid rubato of the intro dissipates into the driving 6/8 main section, featuring Metheny’s infamous “pop” of his E string, (something he uses to check the reverb levels of the guitar and to signal sound man David Oakes) leading into the triumphant main theme. Metheny’s solo is beautiful, never at of a lack of ideas, Rodby’s rock steady bass churning out the changes, and Marcal decorating the proceedings when needed. Interestingly this album was the first to feature Metheny’s guitar to be miked to pick up a semi acoustic quality of his hollow body guitar, something that has subsequently been a feature of his sound the past fifteen years, but the test pilot of that sound so to speak appeared here. “So May It Secretly Begin”, a richly detailed melodic line that has been one the guitarist continues to investigate in stripped down contexts to the present is also meant as a nod to the CTI era orchestrations of arranger/ composer Don Sebesky, and painter Paul Klee. While the tune and Sebesky only bear a superficial resemblance, the depth of texture created by swelling Synclavier strings and Mays’ use of flute patches set the tone on a grand scale for the graceful, sensuous melody stated by Metheny. The acoustic like attack of his stereo miked Gibson ES 175 is boldly highlighted once more as it was on “Minuano” and again on “Third Wind” setting the stage for one of Lyle Mays’ finest lyrical solos on record. The piece with subtle details of layers of activity throughout is something that became a Metheny trademark gives the listener food for thought upon multiple hearings. Additional bright color is added at the close with Ledford and Blamires doubling the main melodic line in falsetto vocals. “So May It Secretly Begin” thoroughly a standard of the Metheny repertoire, actually has a puzzling place out of jazz, as the piece has been sampled multiple times by hip hop artists. The reason why it seems puzzling is that the bridge and main “hook” of the song have been sampled pretty much straight through, such as on Statik Selektah’s “To the Top”, and it sounds extremely out of context without the rest of the tune. While even more people get exposed to the beauty of Metheny’s music through the sample it reveals an issue that producers seem to have with the guitarist’s music in that they seem to be unable to negotiate successfully the rhythmic and harmonic complexities it contains. Nevertheless, the tune placed second on the album continues an inspired thread that concludes the first side on LP, with “Last Train Home”. “Last Train Home” may actually be one of Metheny’s most famous and visually evocative melodies. One literally can imagine a train making a long journey as the sun sets, or already at dusk courtesy of Wertico’s steady chugging brushes on snare, and Rodby’s never flagging pulse. The melody, played on Coral electric sitar, a stalwart instrument of many 60’s and 70’s pop classics is a melancholic glow all the way through, with a slight Asian tinge towards the end of the melody. The guitarist’s solo is one of his best ever in terms of purely being in service to the song, and the backgrounds of Ledford and Blamires’ vocals are exquisite building to the tremendous post solo interlude contributed by Lyle Mays (though the tune is solely a Metheny composition) with breathtaking three voice counterpoint resolving in a hymn like and serene manner, to usher in the melody to fade out. “Last Train Home” has found tremendous life outside the record, infamously appearing in a Publix commercial, and most recently used as the closing theme for the Japanese animated JoJo’s Bizarre Adventure television series once again exposing an audience to Metheny’s music that may not have heard otherwise, a sure sign of the lasting legacy of “Still Life (Talking)”. The back half of the album begins with the powerful one-two punch of “(It’s Just) Talk” and the classic, anthemic “Third Wind”, smoldering Brazilian groovers with inspired melodies and solos. “(It’s Just) Talk” began life in embryonic form as the PMG played the piece in radically different form live during 1981-2 where it sounded more like a Lee Morgan “Sidewinder” boogaloo than what it became known as. The melody of the final version on the album showcases Ledford and Blamires soul tinged approach to wordless vocals perfectly with the backdrop of Armando Marcal’s ebullient cuica barks, the tune is probably known best for it’s great repeating vocal line at the end of the tune which generates tremendous momentum. Live, the tune showcased creatively bursting solos from Metheny and Mays and a heavily pulsating rhythm courtesy of the rhythm section. Marcal’s timbale blasts that signal “Third Wind” usher in a composition that’s not only famous for it’s wonderful melody, but the quicksilver lightning guitar break. Metheny’s nod to the jazz tradition is explicit, with a burst of notes codified in his own bebop dialect conjuring Charlie Parker’s break on “A Night in Tunisia”. For all the frankly absurd criticisms of many that the guitarist does not swing, “Third Wind's” illustrious break and solo throws such claims out the window. His invention is liquid, furious and meaningful with Wertico’s constantly shifting ride cymbal swing behind him, comping and orchestrations from Mays put a bold exclamation on the proceedings and move the piece into a dizzying second section. The chromatic movement of this part of the composition further exposes the ties to bebop. Again, for the consideration of space on the subsequent “Secret Story” and “We Live Here” tours, this middle section was cut, and turned into a drum-percussion duet section incorporating portions of the tune “Straight on Red” from the album “Travels” (ECM, 1983). Following the polyrhythmic web of the second section, with a heroic bed of Mays’ synth and brass laid down, the classic final melody over a churning 12/8 rhythm is revealed. The imminently singable vocal figure sets up a trademark smoldering Roland GR300 guitar synth solo for Metheny, one of his finest moments on record. The guitarist has said that the use of the GR300 enables him to get into the range of an alto or soprano saxophone, and the horn like quality suggested by the synth’s peculiar yet enchanting saw tooth wave tone take full of advantage of his aims. The last two pieces, Lyle Mays’ dark, haunting “Distance”, primarily synth driven, with eerie atmospheric vocals, percussion and subtle undercurrents of Synclavier triggered sampled sounds, along with the guitarist’s stunning, heart wrenching “In Her Family” form a through composed final chapter and epilogue of sorts, as one uninterrupted piece. “Distance” would take on a considerably different complexion live, never really played verbatim as on the record it opened vistas for a searching Mays improvisation, otherwordly Synclavier guitar triggered soundscapes, and eerie colors from the rest of the band. 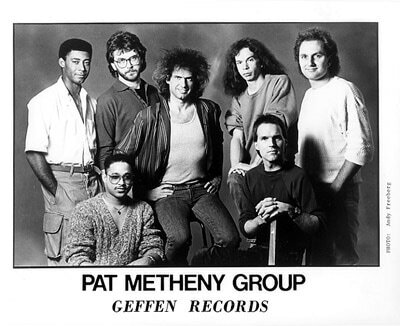 This engagement of the Group’s avant garde proclivities of the band as a radio recording from the Montreux Jazz Festival and 1987 video from Argentina on youtube demonstrate the breadth of just what this ensemble was capable of, nothing off limits in the “one long song” universe of Pat Metheny. To close this appreciation of an unforgettable album, a note about how the legacy of “Still Life (Talking)” remains a vital force in contemporary jazz. The Pat Metheny Group’s “Brazilian trilogy” which started with the aforementioned “First Circle”, the sound was so engaging that it kind started a life of it’s own. While the guitarist by no means spearheaded the Brazilian jazz movement he was clearly inspired by musicians who deeply influenced him like Toninho Horta and Ivan Lins, and brought that joy he felt from Brazilian music. The one of a kind accessibility of “Still Life (Talking)” spawned what has occasionally been called in Metheny fan circles as “Pat-lite”. The fact that the album had come in the prime years of so called smooth jazz radio, and received airplay on said stations created this culture of some bands trying to capture the feeling of the PMG on the surface but without the spark of the inner workings that truly make his music special. For example Canadian guitarist Brian Hughes’ album “Under One Sky” (Justin Time, 1992) and the track “Nine Doors” is an obvious display of love for Metheny, and sounds like something distinctly from the “Still Life” period, but to these ears, it’s missing something. When the deluxe, 2 CD remastered edition of Metheny’s watershed solo “Secret Story” (Nonesuch/Metheny Group Productions, 1992) was reissued in 2006, the guitarist unearthed “Understanding”, a tune that was intended for “Still Life (Talking)” but rejected. The tune was performed live in 1987, as a folksy-pop inspired ballad, with room for improvisation, but the released version is purely composed with a string section from the original “Secret Story” sessions, and additional guitar from Metheny. Regardless of it’s brief length the composition is a gem, and could have stood with the original “Still Life” album. The 2006 Nonesuch remaster and reissue of “Still Life (Talking)” is definitive, a stone classic that remains one of the best recordings in the Pat Metheny catalog. The album really stands the test of time with stunning compositions, immaculate sound and production. No collection should be without it. Footnotes: Pedro Aznar, the phenomenal Argentinean vocalist and multi instrument would return for the follow up “Letter From Home” (Nonesuch/Metheny Group Productions, 1989) and subsequent 1991 world tour that produced “The Road To You: Recorded Live in Europe” (Nonesuch/Metheny Group Productions, 1993). In a 2006 podcast supplement celebrating the reissue of the album, Metheny noted the band really disliked “Still Life (Talking)” initially and the album was nearly shelved. By concensus, they decided to release it, and the album later won the 1988 Grammy award for Best Jazz Fusion Performance, and was a certified gold record having sold over 500,000 copies.